Would you like to find a home for the extra cotton and acrylic taking up room in your stash, as well as help others at the same time? Donate to a charitable organization that put's both cotton and acrylic yarns to good use. 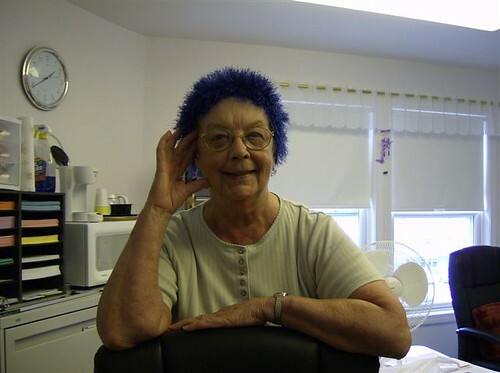 Yup, the evil acrylic is wanted and needed by the ladies at NH Services who knit items for needy children and residence of nursing homes that require machine washable items. They use the cotton for kemo hats ... the softer the better. If you have a lot, consider the tax deduction you could get also. 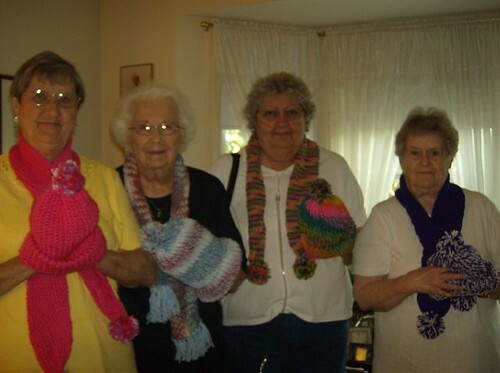 The RSVP Volunteers (there are 60 total) ... love to knit ... love to crochet ... and love contributing to others. This is something they do all year long by the way. I've recently received this note from the Volunteer Services Director, Dee Martin that I want to share with you. We would like to share with you the wonderful support from various places in the country that have responded to our request for yarn because of your website. Yarn came from all over New Hampshire, Vermont, New York, Indiana, Pennsylvania, Virginia and many many towns in Massachusetts. 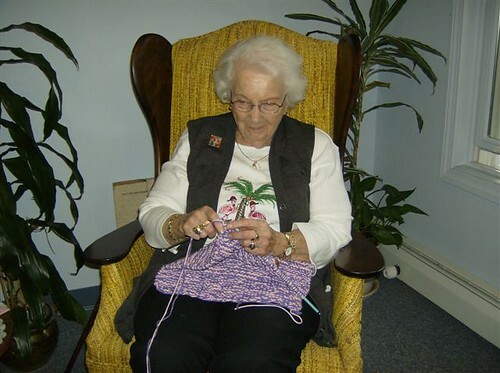 Our volunteers, in turn, create beautiful knitted and crocheted items (such as hats, mittens, scarves, afghans) which are delivered to needy families, non-profit organizations, and nursing homes throughout the area. 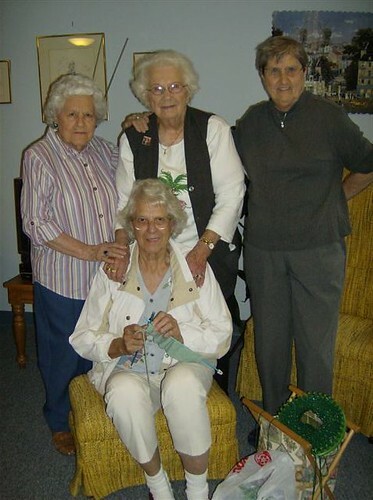 Below are a few pictures of just a few of the lovely ladies doing the knitting & crocheting for others in need. 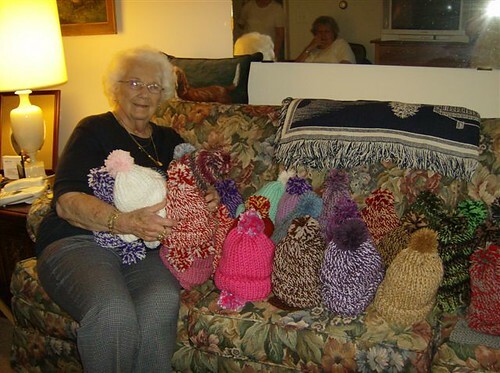 In fact, The first picture is of Helyn Malay (93 years young) who had started a knitting group called "Yarn It All" to knit hats, mittens and scarves for low income area school children. The other pictures include what they've been knitting and crocheting that are ready to be distributed during the Holidays. I think I would also like to give every one of them a big hug. 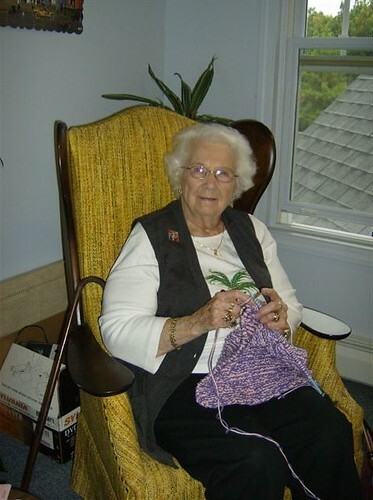 The weather outside is starting to cool off and if that doesn't make you want to start knitting maybe the upcoming Pine Street Inn Knit-A-Thon will! Time is going so quickly and the November 4th Knit-A-Thon is a little over a month away. So please, don't be a square.... KNIT ONE!!!!! STEP 1: Ladies (and gentlemen) start your needles! Start knitting your 9 inch by 9 inch squares. They can be ANY COLOR, ANY MATERIAL, ANY GAUGE, ANY PATTERN... And, you can feel free to knit as many or as few as you are able!!!! STEP 2: Go forth and multiply! If you can knit one, you can knit two.... And so on, and so on. Each blanket will take 35 squares. Even if you can only knit a few - they will help complete a blanket. STEP 3: Please follow the easy, step by step instructions and make your very own webpage at www.firstgiving.com/pinestreetinn. STEP 4: Estimate how many squares you can knit by November 4th. I estimated that I will make 50 - which is a lot... In fact, I am knitting while I type this email... really! 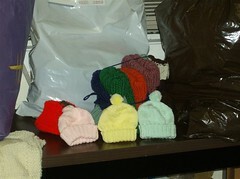 STEP 5: Ask your friends and family to support your knitting efforts by pledging on a per square basis on your webpage. For example: $1.00 per square x 50 squares = $50.00. Or they can make the dollar donation of their choice. The donations you collect on your secure First Giving webpage will go to the Pine Street Inn's Supportive Housing Program. STEP 6: Join us on Sunday, November 4th from 10:00am to 5:00pm at the Women's Inn at Pine Street, 363 Albany Street, Boston (you can drop in any time during these hours). Bring your knitted 9 x 9 inch squares on November 4th and together we will assemble them into blankets. 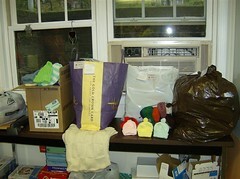 Check out http://www.pinestreetinn.org/knit-a-thon/ . If you cannot make the event, please knit anyway... Your squares can be collected by a fellow knitter or shipped to the event.